A cockpit cushion with the quality of a Comfort Seat. Extremely suitable as a seat cushion but without a frame or hinge mechanism. The cover is made from Sunbrella acrylic, is water and UV-resistant and available in five different colours. The cushion filling is Calipure open cell structure foam. This foam is rot and mould-resistant. The zip in the cover means the filling can be easily removed so that it can dry quickly. The handle on the Cockpit makes it easy to carry. The Cockpit is available in 4 standard colours. 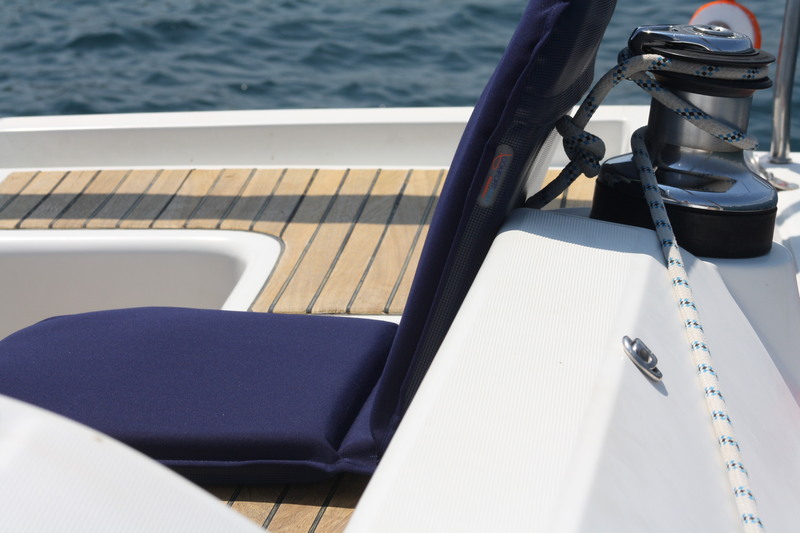 This chic, intense dark blue has been the most popular colour choice for water sports for many years. Its allure is emphasised by the matching shade of the dark blue used in the non-slip backing. The Captains Blue Cockpit is a favourite among many water sports enthusiasts. This red is in between scarlet and burgundy: a warm colour with a cool allure that matches a nautical setting perfectly. Whether traditional or modern, you will never tire of your Dark Red Cockpit. Black is a modern colour that can now be called traditional too. Where previously dark blue was the basic colour for nautical decor, black has been making convincing gains in recent years. And we can understand why! Your Cockpit has a grey backing, giving it a strong, timeless colour combination. This charming light grey goes well in any setting, either on or beside the water. The Cadet Grey Cockpit has a grey non-slip backing.